The Economic and Financial Crimes Commission has set up a special team to interrogate Governor Ayodele Fayose of Ekiti State next week, The PUNCH can confirm. The governor is expected to report at the EFCC head office in Abuja to meet with the commission’s Director of Operations, Umar Mohammed, after which he will be grilled by a team of operatives. The governor is expected to be arraigned after investigations. Apart from the alleged N1.2bn fraud, Fayose is also under probe for alleged contract fraud. Speaking on Tuesday, a spokesman for Fayose, Mr. Idowu Adelusi, said his principal was ready for the EFCC. He said, “Governor Fayose is an honourable man. He will not run away. He has already stated that he will make himself available next Monday once his tenure expires. He made this clear in a letter recently. Even when he was not under immunity, the governor honoured the EFCC invitations. 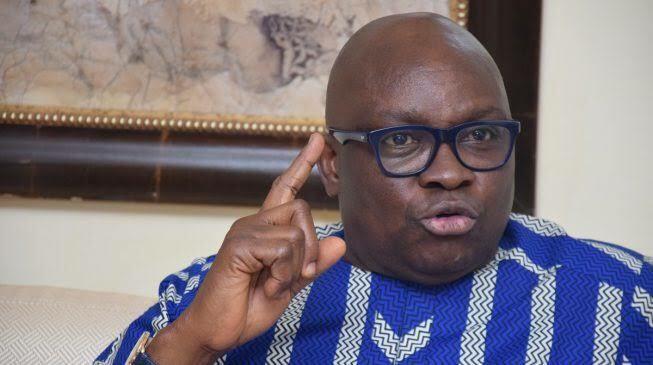 Meanwhile, Fayose has filed a N20bn suit against the EFCC for placing him on watch list and directing security agencies to arrest him, if he attempts to travel out of the country. He said the directive against him despite being a sitting governor breached his constitutional immunity and exposed him to public opium and ridicule. Fayose had in a September 3, 2018 letter by his counsel, Obafemi Adewale, given the EFCC 72 hours to withdraw the request/directive to security agencies and publish a written apology in three national newspapers and the social media. A statement issued on Tuesday by his Special Assistant on Public Communications and New Media, Lere Olayinka, said the suit was consequent upon the EFCC’s failure to accede to his demands as contained in the letter. He asked the EFCC to tender a written apology, which should be circulated to all security agencies in Nigeria and that same should be published in at least three widely read national newspapers and the social media. The governor also sought a declaration that the statements contained in the EFCC’s letter of September 12, 2018, and addressed to all security agencies n Nigeria portrayed him as a criminal, a fugitive and a run-away from the law, and that the statements were not true, were malicious, and not fair.